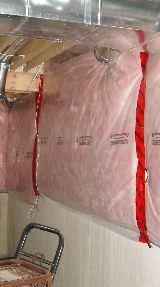 Blanket fibreglass insulation on foundation wall in new home construction. A special tape is required to seal tears and joints in the vapour barrier. Batts can also be used to insulate a floor above an unheated crawl space. This can be a very unpleasant task and I speak from experience. Some years ago, I helped my son to re-insulate the floor underneath his home. Laying on our backs we first removed the old insulation. Next we added 2"x3"s to the 2"x6" floor joists and stapled a 6 mill (heavy duty) polyurethane vapour barrier against the floor and sides of the joists. 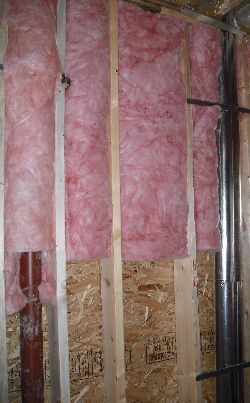 We then installed friction-fit R-20 batts of fiberglass insulation which had to be held in place temporarily by driving nails into the sides of the joists. Once that was done we installed sheets of galvanized diamond mesh (also known as stucco wire mesh) to prevent the insulation from sliding down and the mice from coming in (the old insulation was riddled with mice nests). While doing the job, laying on our backs and working directly above our faces, we were showered first with debris falling from between the floor boards while nailing on the 2x3s and later by insulation particles. Needless to say that wearing proper eye protection and face mask is a must.